The town of Ancient Thira is built on the hill Mesa Vouno that dominates the southeast coast of the island of Thera, and was founded by Dorian colonists during the 8th century BC and was from its inception until the end of antiquity, a civil, administrative and religious center of the city-state of Thera. Remnants of Ancient ThiraHabitation on the island documented from the Neolithic period (mid 5th millennium BC, at least). Scattered facilities, with the main settlement of Akrotiri, testify to the habitation until the mid 17th century BC, when a violent volcanic eruption in fragments and buried under thick deposits of volcanic material. Since then desert lives for centuries. A small installation in place Monolith shows re habitation for some time in the late prehistoric era (early 12th cent. ), Systematically, however, and without interruption, epanakatoikeitai from the 8th century. BC, in historical times longer when installed Dorians settlers. On the island grow longer, except the town of Ancient Thira, several settlements and smaller facilities in several locations. The information written sources Thera are limited. According to the ancient historian Herodotus, Thira Aftesionos, nee Kadmeio who reigned in Sparta, after the death of King Aristodimou as guardian of minor children when children reach adulthood and assume authority departs, along with many Spartans and some Minyes for Thira, where he founded a colony and gives as settler, named the island, which until then was called Kallisti. From him we learn also that elite hunting, after oracle of Delphi, founded in 631 BC on the coast of North. Africa, Cyrene, the only colony of Thera.Remnants of Ancient ThiraAt the beginning of the Peloponnesian war, in 431/0 BC, Thera forced to join the Athenian Alliance. After the defeat of the Athenians in place Aigos Rivers in 404 BC, falls under the influence of Sparta, and then joins the B Athenian Alliance founded in 376/5 BC, which must remain until the battle of Xaironeias in 338 BC, like other Cyclades. After 288 BC falls within the ambit of the Ptolemies, who were then the change in the acquisition, installing guard and organizing it as occupied territory. The period of Ptolemaic rule that lasts until 145 BC It is a period of prosperity for the island. During the Roman imperial era Thera administratively part of the province of Asia, and around the middle of the 3rd century. AD They seem to accept raid from Gothic tribes; a little later, with the administrative reforms of Diocletian, under its newly created “Province of ernments’ as most of the Cyclades. 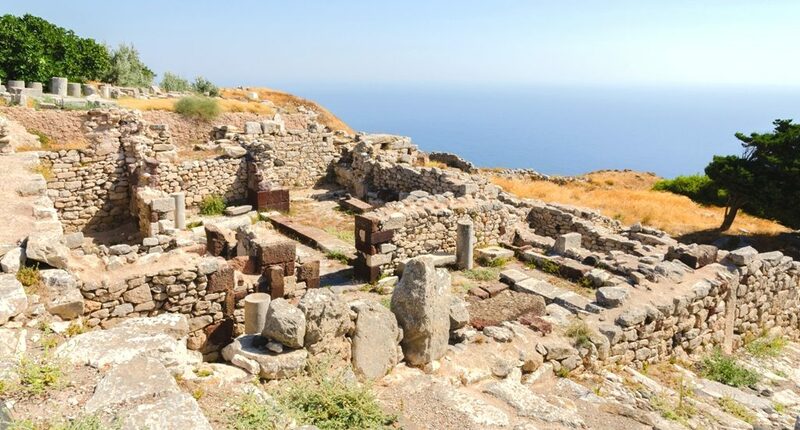 The city of Ancient Thira flourished during the Archaic and Hellenistic period. Testimonials for acne during the Archaic period and the first centuries of inhabitation mainly offer its cemeteries and places of worship as well as the continuous habitation not allowed to be rescued despite only few building remains from the time of its establishment until the Hellenistic period. Remnants of Ancient ThiraIn the latter, which is mainly and the form in which preserved the city develops intense building activity. Then it seems that formed large building islands and built the terraces that define the image of the city, upon which its buildings are built of. The market is expanding, established numerous public buildings and residential area, limited initially to the sheltered area around the Agora, spreading even to the winds on the exposed parts of the back. In parallel multiply the places of worship, established sanctuaries honoring foreign deities and the Ptolemaic kings, the cults are admitted in this period, and built buildings for the accommodation of religious associations. At this time, multiply and sculptures that adorn the market, public buildings and sanctuaries, while relatively wealthy is the equipment of the houses. In Roman times, when the first-second century. AD, the building activity, although significantly reduced, continues. The market extends even once, made public baths and made extensive repairs-conversions in public and private buildings. Remnants of Ancient Thira From the 3rd century. AD city decline, as is preferred the most comfortable habitation to secure the seaport then, inhabited, however, after the end of antiquity, the early Christian period (4th-6th century AD. ), time in which established two basilicas. In the 8th century. AD when the Arab raids now make life on the coast dangerous, offers ruined shelter to residents of the seaport. Then built wall on the western edge of the ridge, founded the church of St. Stephen on the ruins of a basilica and constructed makeshift accommodations crowd of ancient building materials among the ruined buildings. Shortly thereafter ceases to be inhabited permanently. The city and parts of the extensive cemetery revealed by the large-scale excavations carried out by the German philologist epigrafologos Hiller von Gaertringen and colleagues (1896 to 1902). Excavation at the expense of the Archaeological Society at Athens conducted at the city cemetery and the Commissioner of Antiquities Law. Zafiropoulos (1961-1982), while the 1990 small-scale excavations in the city and its cemeteries conducted by the Prehistoric-Classical Antiquities. Numerous finds from excavations in the Archaeological Museum in Fira. In the years 2003-2008, the Prehistoric-Classical Antiquities implemented at the archaeological site the project “Configuration Emergence Archaeological Site Ancient Thira” (2003-2008) with a budget of 1,760,821.71 euros, which was co-funded by 75% by the European Union and 25% from the Greek State.